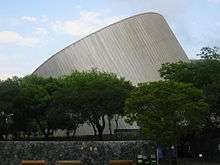 Alfa Planetarium (Spanish: Planetario Alfa) is a planetarium located in Monterrey, Nuevo León, Mexico. This institution was created by ALFA (Mexico) in 1978 to promote science and technology in Latin America. It includes an interactive science museum, an Omnimax system cinema, an aviary, "The Universe Pavilion", and an area for temporary exhibits and events. The Alfa Planetarium is one of the most visited cultural centers in Mexico.